In this blog, Isabel Schmidt, Executive Director of Statistics South Africa talks about the importance, as well as the challenges, of measuring the contribution of volunteerism in South Africa. 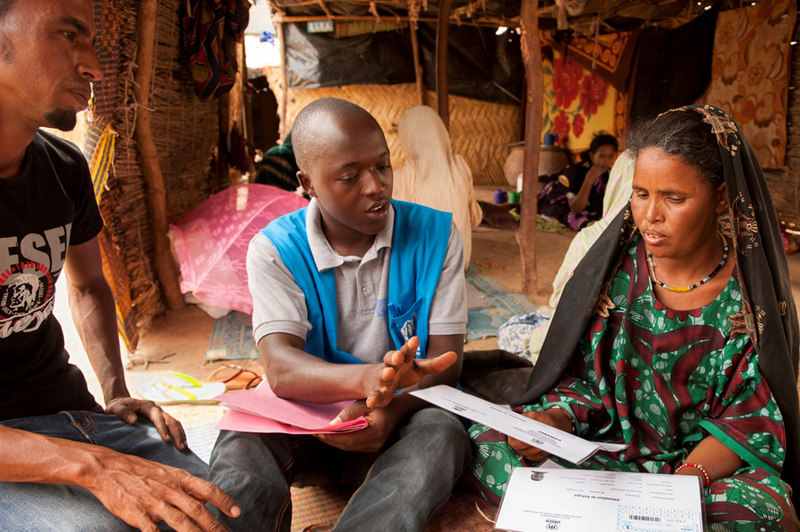 A volunteer counsellor supports refugee registration at a camp in Burkina Faso. Tshepiso steps back and admires his handiwork. As part of his contribution to Mandela Day, he has painted the interior walls of a corrugated iron shack that serves as a crèche for young children in an informal settlement in Johannesburg. In the spirit of ubuntu, he regularly ferries his elderly parents, aunts and uncles to hospital or assists them with shopping. Just last weekend he repaired a broken kitchen cabinet door for his neighbour, Mrs Potts. Enabling people such as Tshepiso to drive their own development priorities and agenda for change is one of the cornerstones of sustainable development. An active civil society is an essential component of a cohesive and well-functioning state. By encouraging an active citizenry, the state can potentially achieve more, using less financial resources, and also achieve greater social cohesion in the process. Volunteerism asks: how can I make a difference in my extended family, in my community, in my country and at a global level? According to the Volunteer Activity Survey conducted every four years by Statistics South Africa (StatsSA), the number of South Africans doing volunteer work increased from 1.3 million in 2010 to 2.2 million in 2014. The latter figure represents 5.8 per cent of the South African population aged 15 years and older. The average annual number of hours per volunteer was 277, and their efforts were valued at R9.8 billion (USD0.8 billion). How comparable are these statistics with estimates produced in other countries? And can everything that Tshepiso does for others, without remuneration, be considered volunteer services? As these questions demonstrate, statistical standards and definitions are essential to the task. StatsSA defines a volunteer as “a person aged 15 years and older who did any unpaid noncompulsory work”, where unpaid non-compulsory work is defined as “time an individual gave without pay through an organization or directly for others outside their own household in the four weeks preceding the survey”. Therefore all of Tshepiso’s most recent activities that were not remunerated are included, with the exception of those done for his elderly parents. They are excluded because they live in the same household as Tshepiso. The potential for discrepancy in standards and comparability across countries is around how voluntary work for the household and/or related households is defined. In the African context, where aunts and uncles are often considered as mothers and fathers, it is difficult to pinpoint where “related household” starts and stops – does it include all blood relatives, regardless of how far removed? StatsSA overcame this dilemma by including unpaid non-compulsory work done in all households except a person’s own household. Another potential point of divergence in international comparability is the issue of reimbursements received towards the coverage of costs whether these constitute payment within a definition of unpaid work. According to the ILO definition, only moneys received that amount to more than one third of local market wages are considered remuneration rather than cost coverage. But in the absence of clear national payment standards or detailed income classifications for various activities, the data collection process is more complex and may result in inconsistent statistical standards within and across countries. The ILO standards adopted at the 2013 International Conference of Labour Statisticians provide an important starting point for internationally comparable statistics on volunteering. However, more qualitative and quantitative research is needed to develop our concepts and tools particularly to reflect manifestations of volunteering particularly in Africa and the global South. As well as the issues identified above, there is also a need to standardize survey recall periods and ensure coverage of informal volunteering in all contexts. Working together with the ILO and UN Volunteers, StatsSA will continue to share our experiences to enable the standards to evolve.